Krishna was one of the Hindu gods. He was actually just one of the many forms of the god Vishnu. People thought of Krishna as one reincarnation of Vishnu. 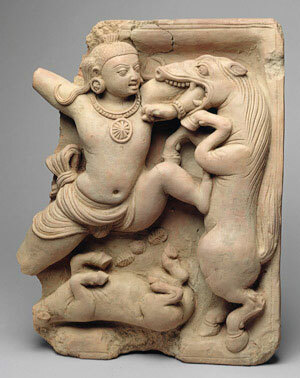 The god Krishna doesn’t appear in Indian stories before about 300 BC. Probably he and Vishnu were both newer gods that came into Hinduism around the time of the Mauryan Empire. About this time, the older gods like Indra, with their demands for animal sacrifice, started to seem old-fashioned. Krishna appears in many stories in different forms. Sometimes he is a child. Sometimes he’s a flute-player who calls people’s souls. Other times he is involved in love affairs with Hindu goddesses, or he’s a great leader. Krishna’s most famous story is in the Bhagavad Gita, written about 300 BC. In the Bhagavad Gita, Krishna is disguised as a charioteer. He tells the young prince Arjuna how to act according to his dharma, and generally what is good and what is bad. Cite this page: Carr, K.E. Who is Krishna? Hinduism in India. Quatr.us Study Guides, July 21, 2017. Web. April 23, 2019.